Accumulating evidence indicates that post-injury inflammation characterized by activated microglia contributes much to the neuropathology of ischemic injury. Several studies have demonstrated that microglia exhibit two entirely different functional activation states, referred to as classically activated (M1) and alternatively activated (M2) phenotype. Promoting microglial phenotype to switch from M1 dominant to M2 dominant might be a promising approach for handling ischemic injury. However, the comprehensive mechanism that underlines microglia polarization in ischemic brain remains unclear. Neuronal erythropoietin-producing human hepatocellular carcinoma cell receptor 4 (EphA4), the richest Eph receptor in the central nervous system (CNS), upregulate after ischemia and may have the potential to regulate microglia activation. We hypothesized that modulating EphA4/ephrin signaling could affect ischemic injury through controlling microglia polarization. We therefore knocked down neuronal EphA4 with short hairpin RNA (shRNA) and determined the role of EphA4/ephrin signaling in oxygen-glucose deprivation and reperfusion (OGD/R)-induced injury. We found that EphA4 shRNA treatment attenuated OGD/R-induced apoptosis and microglia proliferation. 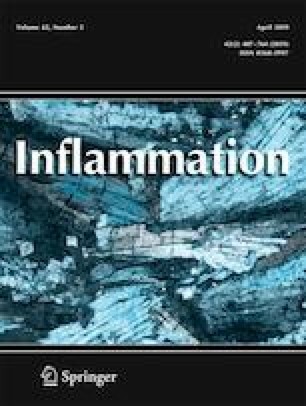 Neuronal EphA4 knockdown also promoted microglial M2 polarization, which reduced pro-inflammatory mediators and released anti-inflammatory cytokines as well as neurotrophic factors. We further revealed that EphA4 shRNA treatment functioned through RhoA/Rho-associated kinase 2 (ROCK2) signaling, a key mediator of microglia alternative activation. Together, these data suggested that blockage of EphA4/ephrin signaling between neuron and microglia decreased OGD/R-induced injury by promoting alternative activation of microglia via RhoA/ROCK2 signaling. Hui-Xing Wei and Pei-Sen Yao contributed equally to this work. The online version of this article ( https://doi.org/10.1007/s10753-018-0914-4) contains supplementary material, which is available to authorized users. This work was partly financially supported by the Fujian Provincial Natural Science Foundation (Grant nos. 2017J05123 and 2018J01175); Startup Fund for Scientific Research, Fujian Medical University (Grant No. 2016QH067); Young and Middle-aged Backbone Key Research Project of the National Health and Family Planning Commission of Fujian Province (Grant nos. 2017-ZQN-46 and 2018-ZQN-48); and the National Natural Science Foundation of China (Grant no. 81802492).